This study aimed to study the role of allergy diagnosed by immunoglobulin E (IgE) in the etiology of pediatric otitis media with effusion (OME) by detection of IgE in middle-ear effusion using the enzyme-linked immunosorbent assay technique. The role of allergy in chronic OME is controversial. This was a prospective study that was carried out on 80 cases; including 60 pediatric patients diagnosed with chronic OME [resistant to medical treatment for >3 months (type B tympanogram) or recurrent after successful medical treatment]. Patients were subjected to a myringotomy with insertion of a tympanostomy tube (grommet tube). Their age ranged from 2 to 15 years. Twenty children had ENT disease other than OME, mostly adenoidal or tonsillar hypertrophy. The serum level of total IgE was assayed in patients and control groups as well as in the middle-ear effusion of patients. The results showed that total IgE was higher in the serum of patients with OME than the serum of the control group; there was a high significant correlation between total IgE in serum and total IgE in effusion in patients with OME. Allergy is a possible risk factor for the development of pediatric OME.
. The most common complication of OME is hearing loss and it is the most common cause of hearing loss in children . Long-standing bilateral OME may cause long-lasting cognitive and language problems in the affected child . OME is proven to be a symptom of allergic inflammation associated with the release of eosinophilic cationic protein into the middle-ear mucosa and effusion in individuals who are universally allergic with a positive skin test . Allergy is associated with increased middle-ear effusion (MEE) volume and the middle-ear mucosa can mount an antigen–immunoglobulin E (IgE) interaction . The mechanism by which allergy might cause OME remains hypothetical and controversial, but may involve one or more of the following mechanisms: (a) middle-ear mucosa functioning as a 'shock (target) organ'; (b) inflammatory swelling of the mucosa of Eustachian tube; (c) inflammatory obstruction of the nose; and (d) aspiration of bacteria-laden allergic nasopharyngeal secretions into the middle-ear cavity . Hurst  described four factors to prove that chronic otitis media with effusion (COME) is an allergic disease. (a) To establish a clear, associated, objective diagnosis of atopy in patients with persistent OME. (b) To detect an association of allergic T helper 2 immune-mediated histochemical reactivity within the middle ear. The concept that active immunologic processes may be localized processes in the middle ear has been established in animal models as well as in humans. (c) To prove that the middle ear is a target organ of allergy, we need to establish that the inflammation within the middle ear is truly allergic in nature. This is what we did in our study by demonstration of IgE in MEE. Therefore, our study provides a part of the answer not the entire answer. (d) To prove the allergy connection requires direct evidence of a dose–response curve and consistency of results . There is no incompatibility between our study and the theory of the role of bacteria and virus in the development of OME. OME is multifactorial disease. Bacteria can be recovered from 21 to 52% of specimens of MEE, suggesting their potential role in the persistence of the condition . In recent studies of middle-ear samples from patients with OME, where bacterial culture and PCR were used, bacteria were cultured in 45% of patients and major pathogens (Streptococcus pneumoniae, Haemophilus influenza, and Moraxella catarrhalis) . This study was carried out in the period from March 2015 to October 2015 in the ENT Department, Menoufia University Hospital, and the ENT Department, Benha Teaching Hospital. This was a prospective study that was carried out on 80 cases including 60 pediatric patients diagnosed with COME [resistant to medical treatment for >3 months (type B tympanogram; pneumatic otoscopy was performed for all patients) or recurrent after successful medical treatment]. Patients were subjected to myringotomy with insertion of a tympanostomy tube (grommet tube). Their age ranged from 2 to 15 years (35 females and 25 males) and there were 20 children with ENT disease other than OME, mostly adenoidal or tonsillar hypertrophy; their age ranged from 3 to 12 years (14 females and six males). The serum level of total IgE was assayed in the patient and control groups as well as in the MEE of patients. Exclusion criteria were as follows: (a) acute otitis media; (b) sensorineural hearing loss; (c) immunodeficiency diseases; (d) Down's disease; (e) cleft palate; (f) patients with gastric problems; (g) craniofacial abnormalities; (h) chronic underlying medical disease. Assessment of history: including history suggesting allergy such as symptoms suggesting allergic rhinitis, asthma, eczema, urticaria, conjunctivitis, food sensitivity, and anaphylaxis. Assay of total IgE in serum by ELISA in the blood sample obtained by sterile venipuncture from both patients and controls. Total human IgE kits were supplied by DSI Srl (Milan, Italy). The total IgE quantitative test kit is based on the principle of a solid-phase ELISA. The assay system utilizes a monoclonal anti-IgE antibody for solid-phase (microtiter wells) immobilization and a mouse monoclonal anti-IgE antibody in the antibody–enzyme (horseradish peroxidase) conjugate solution. The test sample is allowed to react with the solid-phase antibodies; after incubation and washing, the enzyme conjugate will be added, resulting in the sandwiched formation of IgE between the solid phase and the conjugated antibodies. After a second wash, a solution of tetramethylbenzidine is added and incubated for 15 min, resulting in the development of a blue color. The color development is stopped with the addition of stop solution and the color changes to yellow and is measured spectrophotometrically at 450 nm. The concentration of IgE is directly proportional to the color intensity of the test sample. Data were collected on medical history, basic clinical examination, laboratory investigations, and outcome measures, coded, entered, and analyzed using Microsoft Excel software. Data were then imported into the statistical package for the social sciences (IBM SPSS Statistics for Windows version 20.0; IBM Corp., Armonk, New York, USA) software for analysis. According to the type of data, the following tests were used to test differences for significance. Differences between means (quantitative variables) among two groups were compared using the Mann–Whitney U-test; the Z-test; and the Wilcoxon W-test. Differences between frequencies (qualitative variables) in groups were compared using the χ2-test, correlation coefficient (r) for parametric correlation. P value was set to less than 0.05 for significant results. Data were collected and subjected to statistical analysis. The majority of patients in the patient group were females (58.3%), only 41.7% were males. The majority of patients in the control group were females (70%), and only 30% were males. There was no significant difference [Table 1]. The current research showed that the IgE in the serum of the patients in the patient group was 26.4–712.4 IU/ml, with a mean value of 262.6 ± 175.4 IU/ml, whereas IgE in the serum of the control group was 29.6–147.2 IU/ml, with a mean value of 68.5 ± 37.3 IU/ml. This study found a difference between patients and control in the mean total IgE in serum; there was a highly significant difference as P value was less than 0.0001 [Table 2]. There is a very strong uphill linear pattern and a positive correlation. 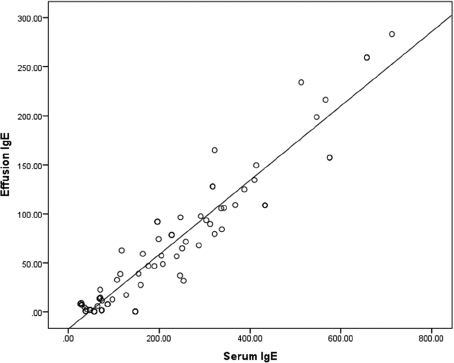 There is a highly significant correlation between total IgE in serum and total IgE in MEE [Figure 1]. Figure 1: Correlation coefficient (r) between total immunoglobulin G (IgG) in serum and total IgE in middle-ear effusion in group 1. The study was carried out to determine the role of allergy in the etiology of OME. OME is the presence of fluid in the middle ear without signs or symptoms of acute middle-ear infection. The persistence of MEE for at least 3 months is defined as COME. It is a multifactorial disease and still remains the most common cause of deafness in children . Although OME continues to be one of the most prevalent childhood diseases, considerable controversy remains in terms of its pathogenesis. OME is primarily a chronic inflammatory condition and the causes of inflammation are multifactorial. Because conventional treatment modalities have failed to eliminate the complication of OME, further research must target the cause and prevention of OME . Recent guidelines from otologists, pediatricians, and allergists on the basis of clinical evidence support the role of atopy in the development of OME. The involvement of IgE-mediated allergic reactions in the pathogenesis of OME has been suggested by clinical observations of a high prevalence of OME among patients with allergies . The important role of allergy in the genesis and recurrence of OME is also supported by the data in the literature that indicate statistically significant differences in audiological characteristics among atopic and nonatopic patients with OME. In fact, in atopic children, a predominance of bilateral OME and greater hearing impairment are found . The serum IgE concentration of normal individuals is 10–100 IU/ml . The IgE serum concentration in a patient is dependent on both the extent of the allergic reaction and the number of different allergens to which he/she is sensitized. Nonallergic normal individuals have IgE concentrations that vary widely and increase steadily during childhood, reaching their highest levels at age of 15–20 years, thereafter remaining constant until about the age of 60 years, when they slowly decline . The current research is in agreement with Passali et al. , who found a relation between allergic rhinitis and the development of COME; their study was carried out on 100 atopic patients with COME followed for 6 months and in whom the allergen was detected. This study was in agreement with Gomaa et al. , who reported that the total IgE was higher in the serum of patients with COME than the serum of the control group. Their study was carried out on 43 cases; 30 patients had OME, mean age 6.8 years, and 13 control children were included, mean age 8.3 years. Blood samples were obtained from patients and control children for the assay of total IgE and serum pepsinogen 1 (PG1). Effusion fluid samples were obtained from the middle ear of the patients during myringotomy and ventilation tube insertion; IgE and PG1 were assayed in the effusion samples. Total IgE and PG1 were assayed using an ELISA . Hurst  postulated that COME is considered frequently to be an IgE-mediated, late-phase allergic disease. The significant incidence of atopy associated with OME has suggested a role of allergy in the pathogenesis of OME. Analysis of inflammatory mediators indicates that the mucosa of the middle ear can respond to antigen in the same way as does the mucosa of the lower respiratory tract. Recent characterization of the mucosa and effusion from atopic patients with OME shows T helper 2 cytokine and cellular profiles consistent with an allergic response, supporting the role of allergy in OME. In addition, animal studies indicate that inhibition of characteristic allergy cytokines can prevent the production of MEE. As the understanding of allergy and its role in the inflammation of OME continues to deepen, focused treatments of OME in the atopic population can be introduced . The results of Keleş et al. showed that total IgE levels were significantly higher in the serum samples of the patient group compared with those of the control group. These results are in agreement with the current research. This study is in agreement with the findings of Alles et al. as they concluded that allergy was more common in a group of children with chronic or recurrent otitis media compared with the general population. This study is in agreement with McCoul et al. , who reported that analyses of the effusion content have consistently shown significantly elevated levels of allergy-related mediators [interleukins (IL)-4, IL-5, IL-6, RANTES, ECP, tryptase, IgE] as well as differences between atopic and nonatopic patients with COME. The present study is in agreement with Chantzi et al. , who carried out a study on 88 children with OME aged 1–7 years, diagnosed by clinical and tympanometric evaluation, and 80 matched controls. A standardized questionnaire was completed to assess factors related to OME and allergy-related symptoms and diagnoses using strict clinical definitions. Specific IgE was measured by skin-prick tests and/or CAP-FEIA. They reported that OME is associated independently with IgE sensitization, symptoms of respiratory allergy, and otitis heritability. In addition, they suggested an interaction between allergy and viral infections in the upper airways, leading to an increased risk of development of OME. Among the above factors, the symptoms of respiratory allergy are the most straightforward targets for a possible intervention; the effectiveness of relevant medications in preventing and/or treating OME should now be scrutinized . Papatziamos et al. described other immunophonotypical features of adenoids of atopic children: increased numbers of IgE + and Fc RI + cells as well as the presence of IgE + plasma cells supposed to be derived from local differentiation, and the results of this study are in agreement with these results. This work was not in agreement with the results of Martines et al. , who found that neither the presence of OME nor Eustachian tube dysfunction significantly affected the prevalence of AR. The current research is not in agreement with Souter et al. , who concluded that the prevalence of allergic symptoms was similar in 6–7-year-old children with OME and the reference group, suggesting a limited effect of allergy in the pathogenesis of OME in this age group. Nasal symptoms were more common in the OME group, which may reflect a higher prevalence of adenoidal hyperplasia. The study of Souter et al. was carried out on 89 children aged 6 or 7 years with OME confirmed intraoperatively during ventilation tube insertion between 2001 and 2005. The prevalence of allergic symptoms and nasal symptoms in children with OME was compared with an age-matched reference group. The present study is also not in agreement with Cassano et al. as they reported that there is no correlation between allergic rhinitis and adenoid hypertrophy and OME; we found an increased risk of resistant and recurrent OME with atopy, and increased serum IgE is usually associated with increased effusion IgE as it supports allergy as one of the major risk factors in the pathogenesis of OME. This study used acute otitis media with impending perforation to compare between the concentration of IgE as an indicator of allergy in the effusion of COME in the case of group 1 (OME) and effusion of acute otitis media in group 2. This work is not in agreement with the conclusion of Skoner et al. , who stated that there is a causal relationship between allergy and otitis media conditions, but conclusive proof is lacking. Allergic rhinitis and adenoiditis are significant risk factors for the development of OME and the risk increases when these two conditions are concomitantly present. Allergy diagnosed by IgE plays a role in the development of COME. Total IgE is higher in the serum of patients with COME than in the serum of the control group. There is a significant positive correlation between total IgE in the serum and that in the MEE of patients with COME. COME may get benefit from treating and control allergic disorders. The work described in this article has been carried out in accordance with the Code of Ethics of the World Medical Association (Declaration of Helsinki) for experiments involving humans; EU Directive 2010/63/EU for animal experiments; Uniform Requirements for manuscripts submitted to biomedical journals. Cummings BJ, Fredrickson JM, Harker LA. Anatomy and physiology of Eustachian tube. St Louis: Mosby-Year Book; 1998. Boudewyns A, Declau F, Van den Ende J Van Kerschaver E, Dirckx S, Hofkens-Van den Brandt A, et al. Otitis media with effusion: an underestimated cause of hearing loss in infants. Otol Neurotol 2009; 30:943–949. Ragab A, Abdel-Haleem Mohammed A, Ali Abdel-Fattah A, Mohammed Afifi A. Prevalence of complications associated with tympanostomy tube insertion. Menouf Med J 201528:918–922. Lino Y, Hara M, Hasegawa M, Matsuzawa S, Shinnabe A, Kanazawa H, Yoshida N Effect of omalizumab on biomarkers in middle ear effusion in patients with eosinophilic otitis media. Acta Otolaryngol 2014; 134:366–372. Damm M, Jayme KP, Klimek L. Recurrent otitis media with effusion in childhood: when should an otolaryngologist consider an allergic etiology? [in German] HNO 2013; 61:843–848. Kenna MA. Diagnosis and management of acute otitis media and otitis media with effusion. In: Wetmore RF, Muntz HR, McGill TJeditors. Pediatric otolaryngology principles and practice pathways. New York: Thieme; 2007. 263–279. Hurst DS. The role of allergy in otitis media with effusion. Otolaryngol Clin North Am 2011; 44:637–654. Brook I, Yocum P, Feldman B, Shah K, Epstein S. Microbiology of serous otitis media in children: correlation with age and length of effusion. Ann Otol Rhinol Laryngol 2001; 110:87–90. Butler CC, Williams RG. The etiology, pathophysiology, and management of otitis media with effusion. Curr Infect Dis Rep 2003; 5:205–212. Martines F, Salvago P, Ferrara S, Messina G, Mucia M, Plescia F, et al. Factorsinfluencing the development of otitis media among Sicilian children affected by upper respiratory tract infections. Braz J Otorhinolaryngol 2016; 82:215–522. Martines F, Martines E, Sciacca V, Bentivegna D. Otitis media with effusion with or without atopy: audiological findings on primary schoolchildren. Am J Otolaryngol 2011; 32:601–606. Amirzargar A, Feghhi S, Nicknam MH, Saki N. Immunological aspects of secretory otitis media in Iranian children, immunoglobulin and complement concentration in serum and glue. Iran J Allergy Asthma Immunol 2003; 2:25–30. De Amici M, Ciprandi G. The age impact on serum total and allergen-specific IgE. Allergy Asthma Immunol Res 2013; 5:170–174. Passali D, Passali GC, Lauriello M, Romano A, Bellussi L, Passali FM. Nasal allergy and otitis media: a real correlation? Sultan Qaboos Univ Med J 2014; 14:e59–e64. Luong A, Roland PS. The link between allergic rhinitis and chronic otitis media with effusion in atopic patients. Otolaryngol Clin North Am 2008; 41:311–323. Keleş B, Ozturk, Gunel E, Arbag H, Ozer B. Pharyngeal reflux in children with chronic otitis media with effusion. Acta Otolaryngol 2004; 124:1178–1181. Alles R, Parikh A, Hawk L, Darby Y, Romero JN, Scadding G. The prevalence of atopic disorders in children with chronic otitis media with effusion. Pediatr Allergy Immunol 2001; 12:102–106. McCoul ED, Goldstein NA, Koliskor B, Weedon J, Jackson A, Goldsmith AJ. A prospective study of the effect of gastroeso-phageal reflux disease treatment on children with otitis media. Arch Otolaryngol Head Neck Surg 2011; 137:35–41. Chantzi FM, Kafetzis DA, Airamis TB, Avramidou C, Paleologou N, Grimani I, et al. IgE sensitization, respiratory allergy symptoms, and heritability independently increase the risk of otitis media with effusion. Allergy 2006; 61:332–336. Papatziamos G, van Hage-Hamsten M, Lundahl J, Hemlin C. IgE positive plasma cells are present in adenoids of atopic children. Acta Otolaryngol 2006; 126:180–185. Souter MA, Mills NA, Mahadevan M, Douglas G, Ellwood PE, Asher MI, et al. The prevalence of atopic symptoms in children with otitis media with effusion. Otolaryngol Head Neck Surg 2009; 141:104–107. Cassano P, Geraldi M, Cassano M, Fiorella M, Fiorella R. Adenoid tissue rhinopharyngeal obstruction grading based on fiberendoscopic findings: a novel approach to therapeutic management. Int J Pediatr Otorhinol Aryngol 2003; 67:1303–1309. Skoner AR, Skoner KR, Skoner DP. Allergic rhinitis, histamine, and otitis media. Allergy Asthma Proc 2009; 30:470–481.